SDG 17: Collaborate to implement the 2030 Agenda ! To fight exclusion, address climate change and reduce poverty, it is now essential to bring together many different actors around a shared vision and a common agenda. This partnership work is crucial: to invent new safeguards and paradigms – based on the values of benevolence, empathy, cohesion and trust – but also to rethink the role and action of each and everyone in the distribution of wealth and in the construction of tomorrow’s world. Sustainable Development Goal (SDG) 17 – Partnership for Achieving the Goals – calls on us to contribute together, at our respective levels and collectively, to the implementation of the Agenda 2030, to reflect and act together in order to reconcile the requirements of a world without poverty and without carbon. This methodology based on partnership is now widely recognized as the reference methodology for achieving the Sustainable Development Goals. Nevertheless, the concrete implementation of this principle, the creation of partnership activities capable of producing a real impact on a significant scale remains a major challenge. This is why it is now important to promote good practices and understand their dynamics, to inspire the community of actors and provide them with concrete success stories. The question of partnership is both a transversal issue and a subject for reflection in its own right. Transversal, because it can occur in all fields of action – in a sectoral or intersectoral manner – and concern a wide range of issues. It is also a subject for reflection, insofar as the partnership as a modus operandi is intended to be analysed, evaluated and optimised to best meet the challenges faced by the actors. The sessions of the Global Convergence Forum dedicated to ODD 17 referred to this plural nature of partnership. The very rich discussions made it possible to highlight several major issues and challenges. While the participation of private actors has been central, the importance of public authorities remains crucial, particularly because of their role in regulating and structuring an ecosystem that is conducive to the proliferation of high-impact multi-stakeholder partnerships. The main obstacle in establishing a partnership? Finding the right person at the right time! And be careful: don’t go faster than your partner! The multiplicity and diversity of actors involved in activities of social and environmental purpose, in France and internationally, raise important questions. In terms of the legitimacy of actions and initiatives, it appears that the public sector, particularly the official development assistance (ODA) sector, is far from being the only actor today. Private actors – especially companies – are now essential. However, according to Jean-Louis Bancel, Chairman of Crédit Coopératif, the latter have not fully grasped their role yet. It nevertheless appears that there is a “French originality” in the willingness of private actors to get involved in development issues, which is intended to be cultivated and developed. Thus, the structure of the French Conseil National du Développement et de la Solidarité Internationale (CNDSI) – which brings together NGOs, trade unions, employers, companies, parliamentarians, local authorities, universities and research centres – shows that the diversity of actors is taken into account. This diversity leads to challenges in terms of harmonizing visions, coordinating and structuring partnership actions. Existing differences may concern both the ambitions of the partners and the strategies deployed, as well as the timeframes for implementation. To avoid the compartmentalization that can result from these differences, it is important to gather around certain fundamental elements, such as common issues or a core of shared values – for example honesty, trust, transparency. For example, Carrefour has chosen the “food transition for all” as its ambition and structuring vision, particularly in the context of its partnership with the “Travail et Vie” (“Work and Life”) association. Communication emerges as a key point and a prerequisite for building strong partnerships. It is through it that the definition of common objectives, means of action and evaluation, or the establishment of appropriate governance, are defined. The governance challenge of partnerships is also crucial because it constitutes the foundation on which the other success factors are built. The absence of a legal structure can, for example, be a difficulty and cause concern to potential funders. Finally, still with a view to structuring joint activities, it seems necessary to be able to categorise the actors, in particular according to their activities. The structuring of an ecosystem that allows everyone to intervene and guarantees the best conditions for success is a major challenge. For Dominique Potier, Member of the French National Assembly, it is important to “restore the responsibility of companies in their actions”. In this respect, it is the responsibility of public authorities to put in place an appropriate legislative framework, in particular by modernising according to needs, in order to guide private actors. This challenge prevails both at the international level, with the perspective of an appropriate normative framework for the UN system, which does not yet exist, and at the country level. France is a pioneer in this respect, with a very successful law in the field of corporate vigilance. As for corporate social and environmental responsibility (CSR), which is one of the pillars of private actors’ commitment to the SDGs, a need for modernisation was also highlighted. Here again, public authorities have an important normative role to play, with a view to establishing a public standard in this area, such as that relating to agro-ecology. This standard would in particular make it possible to address the question of the democratic dimension of decisions taken by companies regarding their aims and the methods for evaluating their actions. It would establish a stable contract taking into account the entire production-consumption chain and allow citizens themselves to redirect the economy. This challenge also calls for the foundation of a European ethic and values, and constitutes a field of hope for European citizens. In the case of banks, the implementation of CSR standards in credit policies is far-reaching. Here too, the question arises of regulation by the public authorities and the establishment of a minimum standard to be respected. The question of measuring the added value of a partnership in relation to the achievement of the objectives of an action was also identified as a major issue. This reflection is part of the more general framework of social impact measurement (link to the MIS article). It is of course important to take into account both qualitative and quantitative aspects. The ability to bring together the right partners to scale up and increase impact is an indicator of added value. The same goes for the ability to inspire peers and set an example. Various concrete approaches were discussed for structuring an ecosystem conducive to high-impact actions. From the point of view of financial tools, impact investing represents a widely accessible modality of action, particularly for individuals wishing to contribute to the efforts that are made. For this tool to be fully exploited, the question of the traceability of individual financing must be raised, since investor clients must be able to be properly informed of the destination of funds. Here again, impact measurement is an essential element. Taxation also has great potential as a means of promoting CSR. The implementation of a new system for accounting for the value of companies was also discussed. Partnerships are particularly necessary in the context of humanitarian interventions. They ensure the sustainability of programs through the involvement of local actors – public authorities, civil society organisations and local populations. In some cases, these actors are the only ones who can intervene as close as possible to the population, and it is therefore crucial to establish partnerships with them. In sudden humanitarian crisis, local actors are the only ones to maintain a real knowledge of the field. Temporality: the partnership has a limited lifetime because it is based on cooperation between national and international actors, the latter having to leave the region or country in the medium, short or long term. Financial issues: in 90% of cases, the local partner will have to enter into a partnership with an international NGO in order to obtain funding from major donors. Security and accessibility issues: they can hinder the establishment and sustainability of partnerships. Local actors are sometimes forced to leave an area, making humanitarian interventions more complex. This is particularly the case in the health sector with the departure of doctors. On the other hand, in some cases, it is international NGOs that physically leave the area so that only local actors can act directly with the populations (in Syria for example). With regard to the challenges and developments required, work must be done to reduce the gap that can be observed between the design of a project – and of a partnership – between national and international actors on the one hand, and the local context on the other. In addition, donors’ expectations in terms of transparency and compliance are not always in line with the location of the humanitarian response. In addition, the design of the programme, and its structuring, can hinder the homogeneous participation of different stakeholders, including local and national actors. For example, humanitarian clusters in Haiti are organized in English, even though local organizations do not use this language. This leads in some cases to an inability for them to have an important place in the humanitarian response. Finally, for Dr. Oubaida al Moufti of the Union of Medical Care and Rescue Organizations (UOSSM), it is necessary to go beyond the balance of power that sometimes exists between local and international actors. Local health staff are familiar with the field. The place of local actors is therefore natural. And evaluation conceived more as a means of capitalizing on experience than as a measure of results. Thus, while territories and their challenges are the primary beneficiaries of association-business partnerships, they are also fertile ground for innovation and change of scale. Beyond a question of scale or local/national tension, it is worth mentioning the emergence of a civil society driven by these innovative alliances. The interdependence of local, national and international levels for sustainable development, for both local authorities and companies, was highlighted, leading to co-responsibility in this regard. As asymmetries among the different parties are thus a crucial element to be taken into account in the setting up of the relationship, it is therefore necessary to integrate these differences in order to reduce inequalities and better distribute roles. The current dynamic, described by the Rameau as a “learning path”, is therefore characterized by an empirical and exploratory approach that deserves to be noted, and sets the stage for the establishment of relevant practices adapted to the needs of the actors. Read the article (In French) published by Le Rameau, which recalls the context, as well as the interim report of the study on evaluation practices. The fact that smoking has worldwide consequences in terms of deaths and its negative impact on 14 of the 17 Sustainable Development Goals (SDOs) is a strong motivation to bring stakeholders together. Tobacco-Free Portfolios, represented at the World Convergence Forum by its Director for United Kingdom and Europe, is an example of partnership action on a remarkable scale. Its action is based on the Tobacco-Free Finance Pledge, which brings together governments (180 parties to the United Nations Tobacco Control Treaty) as well as the health and finance sectors, and aims to raise awareness on the generally unknown links between finance and the tobacco industry, in order to reduce the sector’s access to certain financial mechanisms (credit, insurance, investment). The partners on which Tobacco-Free Portfolios relies to carry out its action fall into a varied typology: major private actors on the one hand such as BNP Paribas, AXA and Natixis, and UN system institutions on the other hand, with the United Nations Supported Principles for Responsible Investment, the UN Environment’s Principles for Sustainable Insurance (PSI), and the Financial Initiative of the United Nations Environment Programme (UNEPFI). Tobacco-Free Portfolios has drawn the attention of its private partners to the link between finance and the tobacco sector, in order to convince them to join the project, make changes in their decision-making, and relay their position. 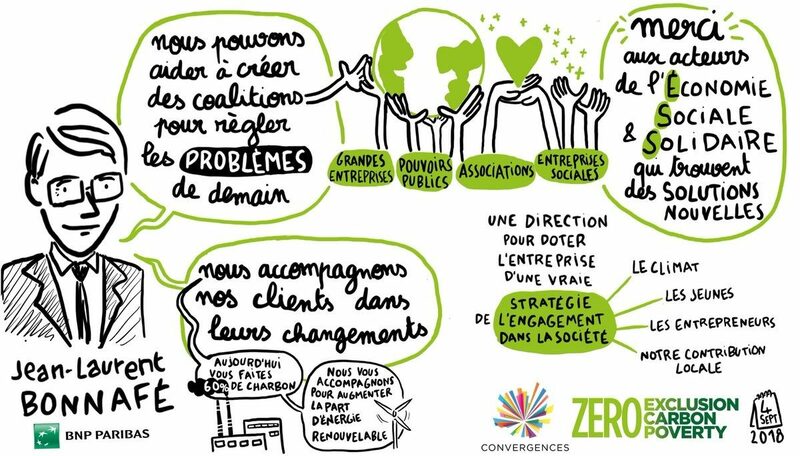 BNP Paribas has developed many partnerships with various types of stakeholders (clients, investors, social enterprises, NGOs) to meet social and environmental challenges, build a more equitable and sustainable world, and support the players they finance in a more responsible transition. The example of the partnership with Tobacco-Free Portfolio illustrates a desire to combine complementary expertise to support decision-making. Other partnerships have been set up, for example with Article 1 (article in French), but also with microfinance institutions in France and Italy and with the United Nations Environment Program (UNEP). It is also about providing added value to the other party. In addition to financial support, BNP Paribas’ support can take the form of a relay to public authorities, the provision of financial engineering expertise, the investment of employees through corporate volunteering, or the facilitation of innovative projects. Our conviction is that Finance should no longer remain neutral. It must contribute, together with other actors in society, to a better future. We must move forward together. We can be competitors, but if in a specific sector the objectives and recommendations converge, we must work together to have an impact. The objective is to find new solutions and support those who decipher the world of tomorrow, those who are progressing in the right direction. Another partnership experience shared during the sessions was the Lemon Aide project, led by Lemon Tri, whose activity aims to encourage recycling in companies. This project goes beyond the question of the environment and is more generally part of an activist spirit, allowing people away from employment to develop their skills and consolidate their professional project by participating in the logistical operation of Lemon Tri’s activities (collection, sorting and packaging of recyclable materials). Thanks to its partnership approach, with the mobilization of forty private partners and the support of the public sector through the Pôle employ (the French employment agency), Lemon Aide combines environmental and social impact. Lemon Aide works in a new dimension of social commitment and a French way of launching initiatives, which is manifested in particular by the desire to innovate and test. The project aims to expand internationally – under the conditions allowed by the legislation concerned – and reach people in other countries who wish to develop initiatives based on models implemented in France. Lemon Aide had received a Convergences Award at the 2017 Convergences World Forum, and was the pro bono partner for recycling at the 2018 Forum. Solidarity crowdfunding is an intrinsically partnership tool. It is based on the idea that in the face of major challenges, it is necessary to act together in order to be able to do more. The Internet has increased the possibilities and given a new lease of life to the old idea of jackpot. The Somfy Foundation, which is too small to fight against poor housing issues, has created a crowdfunding platform, Les Petites Pierres, and an endowment fund. “Les Petites Pierres” intervenes by implementing calls for contributions for local projects and then by supporting the associated projects. More than two million euros have already been mobilized. This approach makes it possible to create the conditions for the success of projects, taking into account not only financial, but also technical and human needs. Les Petites Pierres has developed as a partnership environment around the issue of poor housing with the Somfy Foundation, but also, for example, AG2R La Mondiale or the Red Cross. The international NGO always works with partners of various kinds, health authorities, civil society organisations and of course communities. Putting civil society at the heart of actions is essential, because it is civil society that will be able to influence health policies in the long term. In this sense, both in countries experiencing crisis or natural disaster situations and as part of development programmes, Médecins du Monde is working with these organisations on capacity building support and training proposals for medical staff, so that they can better meet the needs of the population. The NGO considers that its mission has been fulfilled when local actors and populations have received the necessary support to actively participate in improving health in the targeted community. Sexual and reproductive health, in partnership with Médecins du Monde on awareness programs. Pro Bono Lab is a specialist in commitment through the sharing of skills (volunteer work/sponsorship of skills) and is convinced that “every skill is a public good”. Through an Experiential Lab Marathon around the strong issue of fight against exclusion, they showed all participants that their skills were useful in developing concrete tools and solutions. Beyond the production of concrete solutions, this workshop showed the ability of each person to share their skills for a cause important to them. Skills that once shared take on a different scope even if the sharing time is ongoing. Commitment through the sharing of skills has thus demonstrated its strength, impact and virtuosity. The ideal and virtual government of the Social and Solidarity Economy, elected by Carenews readers at the beginning of the year, met on the occasion of this 11th Convergences World Forum. This body, which has no political ambition, brings together specialists recognised by their peers and mobilises them to promote SSE issues and propose concrete measures. In their interventions, the ministers addressed subjects as diverse as official development assistance, food, education, voluntary work, the situation of women in France, access to justice and poverty. In the spirit of this ideal government, they put forward concrete proposals to address these issues. A white paper, to be published in the autumn and intended to be widely disseminated, will include all the ministers’ proposals.